The Wu-Tang Clan’s RZA loves the music of Russell Crowe, his co-star in American Gangster (based on a New York Magazine story by Mark Jacobson). Crowe also has a band. 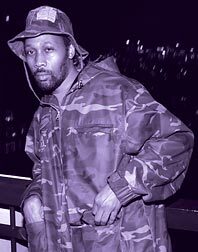 RZA’s particularly enchanted with a song called “Weight of a Man” (“I’m so hard to handle … my life’s a suitcase that’s never been closed / But … you’re not one bit scared / to shoulder / a burden like me”). “I was like, Damn, I kind of feel that,” he said. “My world, hip-hop—[it’s] very promiscuous, but I do have a girl that I have to return to. And I appreciate it so much, but I never knew how to really explain it.” Enter Crowe. “I heard this song, I called her up immediately,” the RZA said. “I was like, ‘Yo! I’m not saying you should get his album—but he definitely has beautiful lyrics.’ ” Next: Do Socialites Fund Terrorism?